Odd One Out Picture Puzzles are very interesting Visual Puzzles which does not require any Mathematical or Logical Skills to solve these puzzles. However one requires good Observational Skills to find the different picture in the given set of picture. 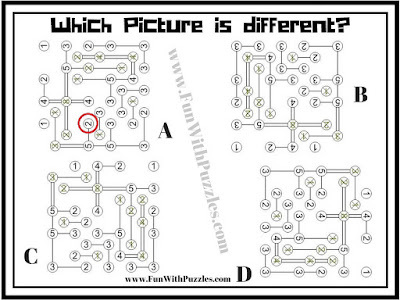 Here is Odd One Out Picture puzzle in which base picture is take from famous Logical Puzzle called Hashi. In this Odd One Out Picture Puzzle, four pictures of Hashi puzzle are given. Three pictures out of these four given pictures are exactly alike. However there is one Hashi picture which differs from the other three picture. Your challenge is to find out which picture is different from others. 1. How many squares puzzle with answer: In this Picture Puzzle your challenge is count the number of squares in the given picture image. 2. 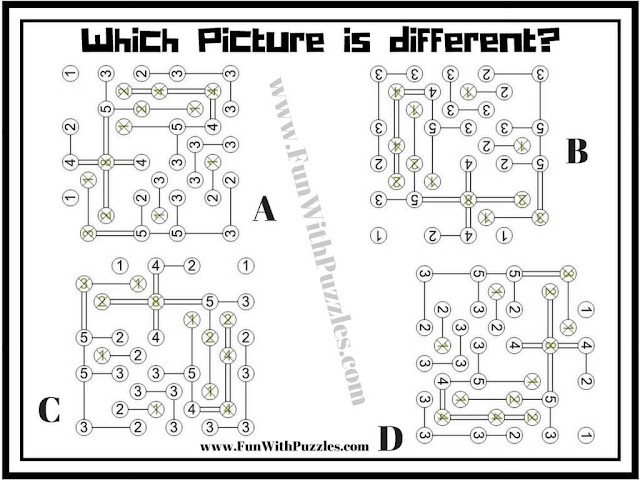 Picture Puzzles for Teens With Answers: It contains different Picture Puzzles which will twist your mind. 3. Simple Fun Brain Teasers for kids with Answers: It contains easy puzzles for kids. However some of these puzzles may be tough to solve for adults. Do try it out and check if you can solve these easy puzzles!! 4. Mind Twisting Out of Box Thinking Brain Teasers: These are the brain teasers which will make you think out of box.